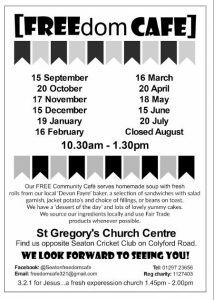 Once a month, on the 3rd Saturday from 10.30am to 1.30pm, St Gregory’s Church throws open its doors and welcomes people to Freedom Cafe. In those three hours between one and two hundred people will come; for a drink and a bite to eat, for a chat, to borrow a book. Some will stay for just a few minutes, and some for an hour or more. At St Gregory’s Church we believe in a God who freely gives of his best to us, whether we deserve it or not, whether we express gratitude or not. 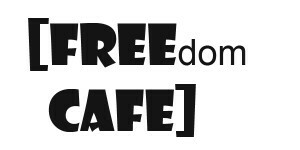 Freedom Cafe aims to reflect this in some small way. That’s why everything is free. What’s the catch? The catch is: Can you overcome your suspicion that there’s always a catch? Mmmm, what to choose? Home-made, warming soup or sandwiches of locally sourced fresh bread and generous fillings garnished with top quality hand-baked crisps and a rocket and tomato side salad? Jacket potato with healthy filling. The dessert menu is even more of a decision-making hurdle – apple and blackberry crumble with crème fraiche, pretty as a picture cupcakes or a slice of ‘melt in the mouth’ lemon drizzle? Filter Fair Trade coffee completes the culinary treat – and yet there are no prices on the professionally produced menu. It’s all free. I can take my fill for the princely sum of nothing. A small basket is on a table near the door but there is no suggestion that a donation is expected. The basket turns out to be for prayer requests, not cash. I am at the FREEdom Café in St Gregory’s Church Hall, Seaton, during a busy lunchtime. This Devon hideaway has become an eating place with a difference. For the last 5 years the organisers are pray it will continue to serve in all sorts of ways as the cafe draws in the crowds and builds a fresh expression of church community.